To provide executives with access to business data on the go, enterprises are adopting iPhones and iPads in droves. Many of these applications have need for smart data visualizations, but are currently restricted by the limited capabilities of available charting libraries for iOS. Some have limited chart types, whereas others lack the visual appeal and interactivity. Open source libraries are not backed by proper technical support either. So what are your options? You would need to have internet access too. We will be using the searchhistogram query from the Topsy API. The exact query is http://otter.topsy.com/searchhistogram.json?q=html5&slice=86400&period=7. You may run this query and see the JSON response, which returns the number of times ‘HTML5’ was mentioned everyday for the last 7 days. 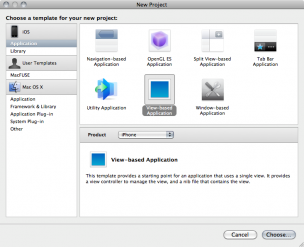 Let us open Xcode and create a View-based project, and save it as FusionChartsXTiOSDemo. Add the JSONKit files, namely JSONKit.h and JSONKit.m to your project too. We have now prepared Xcode with all the files necessary. Let us begin designing and coding! In FusionChartsXTiOSDemo.h, add an IBOutlet for the WebView. Also @synthesize, and release this accordingly. Open your project’s main view controller Interface Builder file (inside the Resources group). For our project this file is called FusionChartsXTiOSDemoViewController.xib. To add a WebView control to your app, drag a UIWebView from Interface Builder’s library to our view. We now need to connect the UIWebView outlet to this UIWebView. From the Document Window in Interface Builder, Ctrl+Drag from File’s Owner to the UIWebView. You should get a popup bubble, click webView . Save your work and close Interface Builder. Remember to @synthesize and release the above properties correctly. Declare the following 4 methods here; we will define them later. As a best practice, let us keep our first task to handle any error that might crop up because of connectivity issues. For this, we need define the displayDataError method. We need to create the HTML that displays the error in plain English to the user in his WebView. [displayErrorHTML appendString:@"Unable to plot chart. Error receiving data from Twitter. After this, let us concern ourselves with the HTTP query and handling it’s JSON response. // Setting up the Twitter query. // Check whether we have a valid connection. // Create the NSMutableData to hold the received data. // Error in receiving data. // Done using the connection. Now that we have made the connection, we need to prepare the 4 delegates of NSURLConnection. We should reset all previous data each time we receive a message at connection:didReceiveResponse. // has enough information to create the NSURLResponse. // redirect, so each time we reset the data. // (Re)Initialize the Twitter data store. Let us implement the delegate that stores the newly sent data. If NSURLConnection returns an error while loading the data, let us explain it in plain English to the user using our own method displayDataError. // Display an error on connection failure. Finally, using JSONKit, let us convert the data stored in self.twitterData to a dictionary. Once the data has been converted, we call the createChartData::(UIInterfaceOrientation)interfaceOrientation method. // Convert received JSON data to an Objective-C dictionary. // Create chart as per current orientation. In the createChartData::(UIInterfaceOrientation)interfaceOrientation method, we need to parse through the dictionary and form our XML. Note that the dictionary has two keys named request and response. 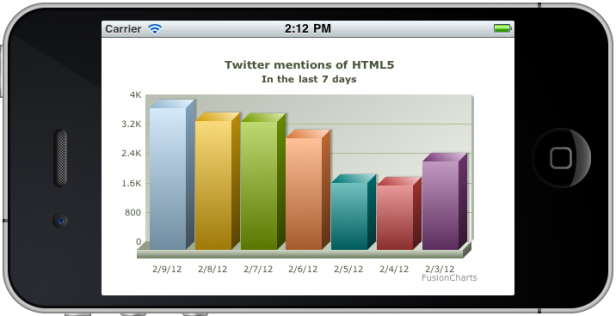 Within response, there is an array named histogram, which holds the count of mentions of ‘HTML5’ for the last 7 days. We need to get hold of this array in NSArray. // Check whether we have valid data. We continue the same code block to iterate through histogramData and form the chart data in XML. Since the numbers in the array are for the previous 7 days, starting from yesterday, we need to calculate and format the date accordingly. In the same code block, we create the HTML required to show the chart. 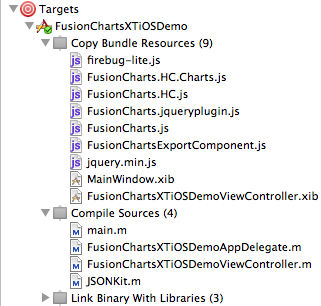 Note the path of FusionCharts.js in the <script></script> tag. We will provide the base URL when we actually load the HTML in the WebView. Finally, we send the plotChart message to self. // Draw the actual chart. Thereafter, we will define the plotChart method. In this method we will provide the baseURL, and load the HTML string we created. However, our work here is not done yet. We still need to add orientation support to this project. Let us override the default value to allow autorotation according to the orientation. // Return YES since we support all orientations. We need to dispose of the chart before we render it again according to the new orientation. To do this, we can can empty chart_container of all the HTML. Let us write the removeChart method to do this. Next, we need to know exactly when the device begins to rotate. For this, we have the )willRotateToInterfaceOrientation:(UIInterfaceOrientation)toInterfaceOrientation duration:(NSTimeInterval)duration class method. In this method, we will first check if the data is valid; so that an error message will be displayed even upon rotation. Next, we store the orientation to which the device is rotating to. Then we remove the chart and render it again according to the new orientation. // as per the new orientation. // Set chart width and height depending on the screen's orientation. Let us now run this project. Rotate your iPhone Simulator by ⌘+Left Arrow or ⌘+Right Arrow. The sample project that we created is available for download. We used Xcode 3.2 and the target was iOS 4.2. Do you have one for Android? 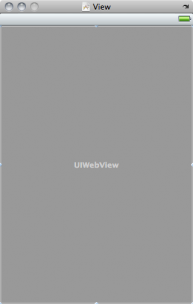 You will have to use the WebView component provided in the Android SDK. In the WebView, you can create charts using a similar methodology illustrated in this post. Let us know when you try it in Android..
What is the significance of ‘0’, ‘1’ in the HTML code? – Width and Height: Dimensions can be specified in pixels or in percentages. When specified in percentages, the chart will relate to the container element. Hi, great tutorial. This is the one that finally helped me run FC inside an iOS app. Great work! Now that I have the example working I’d like to go a bit further and refactor the code a bit. I’d like to run it by you if it’s ok to be sure I’m understanding it all. I’d like to be able to put everything in its place because when I start adding different data sources and reports this will get messy. Thanks in advanced for this great post and for your help. We’re glad that you liked our tutorial. The points you illustrate about refactoring the code to follow MVC are correct. Essentially we’re are calling the View from the Controller itself. The code required to draw the chart should be in the Controller, while the View should simply interpret this code and render the chart. Let us know if this works for you..
I’m trying to make it work but I’m having troubles passing some info between classes. Do you have by any chance an example (code) of some MVC scenario that I can look at and extrapolate to this one? Maybe some other tutorial that I can check and figure it out? I’ll keep on trying. Thanks again for the help. Latest version fusionchart support in android 4.0 .Is it possible lower version android.Is there any solution? FusionCharts XT should work in all versions of the Android OS. Are you facing any issues? Please let us know at [email protected] and we’ll help you out. 1.Yes, FusionCharts XT should work in above 3.0+ for me in android.Then how to figure out chart orientation in various android mobile screen? 2.Then can i write click event on fusion charts.Right now i can write click event on HTML div.But my requierment is click event on charts. Can you give me some tutorial for android with fusioncharts. We don’t have a sample project which uses the Android WebView with FusionCharts XT. However, we are pretty sure the general idea behind the implementation would be the same. I tried this example, b ut am not able to get this chart. I am getting the “Chart will render here” message on the view. You could also check if the HTML & XML strings are proper by writing them to the Xcode console. When you want to configure the chart according to some variables, you would need to follow the same technique as we did to create chart data using Twitter API. Simply pick the variables and include them while constructing the XML string. You could reduce the size of the chart by (a) reducing the dimensions of the UIWebView, or (b) by setting the chart dimensions in pixels. In this tutorial, we’ve specified the chart dimensions in percentages. Can you please explain what you mean by “link the bars … so the user can type”? You need to use the values of the text fields when constructing the chart XML. 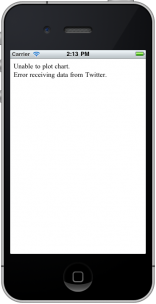 In this tutorial, we’re providing Twitter data when constructing the XML. This change should get you what you want. I had tried the sample approcah and able to present the graphs on my ipad app. But one area where I am confused about drill down charts. In the Web sample , I had seen when user clicks a chart it is getting redirected to particular page and the appropriate graphs are getting displayed. So how to do the same using ios? 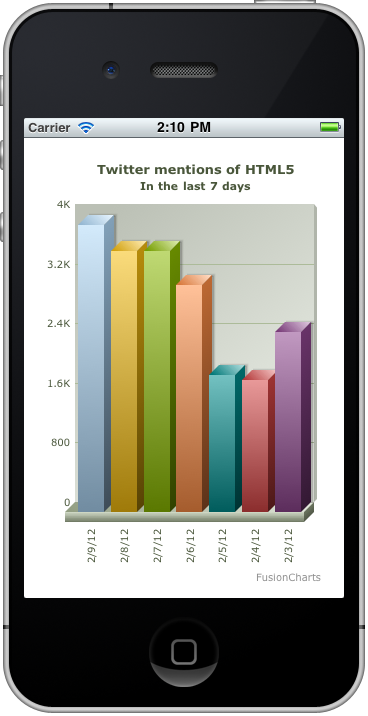 I mean how to detect the click on a particular bar and render apprpriate graph in ios? The functionality that you are asking for is provided by LinkedCharts. Please have a look at the documentation for LinkedCharts. Is it possible to make line graph through the sample code? If it is then please post some code. There’s an link below “Fusion Charts” that redirects to Fusion Charts Website. How can that be removed. If it can be resolved using the paid version please let me know the criteria. Thanks in advance. The ‘FusionCharts’ link that you talk about is present in all Evaluation licenses. This link would not appear in the paid version. You can visit http://www.fusioncharts.com/buy/ to proceed with the purchase. do you guys have a newer version of this integration? Maybe something using the native JSON bundled with iOS since version 5? Thanks and keep the good work! Hi, Its an awesome tutorial and visualization. Good that my friend suggested me about this Charts. I used it and my manager got impressed too…. Thanks a lot. The only problem is how can I get the piechart done? I got the answer… I just replaced Line with Pie2D. How did you show Line graph . Please tell me. Please confirm if you are willing to create the Pie chart using the above sample code. Hi thanks for the tutorial i tried to implement in one of my project using tabbar .my code goes like this ..
everything is working fine but the graph is not loading instead iam getting a text showing Graph will be rendered here . please help me thanks in advance. i have imported all the js files to support it and also jsonkit along with it. still when i run it, it says graph will berendered here. and the graph is not shown. Hi, im facing the same problem. I have given the absolute path and tested. Same “Chart will load here” only coming. but still the app renders a Pie2D chart. Do I need to change any other parameter for rendering a Pie 3D chart? Yes, FusionCharts supports plotting of Pie 3D charts. You do not require to change any other parameters. To render a HLinearGauge chart, FusionCharts.HC.Widgets.js file from FusionWidgets XT pack has to be present in the same folder as FusionCharts.js. Thanks for the good tutorial. However I have been facing an issue where upon redrawing the chart maybe say on a button click, there is a flicker. Wanted to know if there is any way to remove this. A possibility could be because the control is completely removed and the white background is shown in the short interval before it redraws again. Is there a way to retain the background of the control and only animate the bars when i wish to redraw the chart? No, it is not possible to redraw only the data plots while updating.We are working on it to obtain a smooth transition and avoid flickering. Hi How can I remove the white background from chart? The chart is plotting after a gap in webview, its not starting from actual starting point. Can u help me plzz. The background color of the chart is fully customizable. Use “bgColor” to set the background color for the chart. Check if any new line/white space appears before the FusionCharts constructor? How i can pass these type of data to get chart in IOS. Yes, it is possible to get these type of data in iOS. The above XML data format is for Multi Series chart type. So while passing the chart type to the FusionCharts constructor, please specify the Multi Series chart type as per your requirement. Actually i need to pass paletteColors to show the multiple colours in single bar! That’s should be in Horizontal bar charts! Is it possible to do that in Mobile(IOS) version? Is it possible to show multiple values within a single bar (base value in green, exceeded value in red etc within a single bar)? We have done this using using the Fusion charts in the browser but not sure if this capability exists now in the mobile version. If it was possible to display multiple values within a single bar in the browser, the same can be achieved in the mobile version. Starting FusionCharts XT we support automatic fallback and the same code can be executed in both browser/mobile version without changing a single line of code. Hi! I tried compiling your project, but what I receive is a “No data to display” where the graph is suppossed to be, I inserted a flag (actually a NSLog(“Here!”);) right after self.twitterDataError = YES; in order to know if there was a Twitter connection error, but no, is not a Twitter connection error, so I´m suspecting this has to see with the the Twitter API, as this was made with iOS 4.2 in mind and now we are in last iOS 6 version (next release will be 7), any idea what´s going on?? thanx i.a. The message “No data to display” occur since the API key for topsy.com been expired. Can you please regenerate the API key using and append the API key to the below code? I am trying to load fusion Chart in my iPhone application. I am getting message in webview “Chart will render here.” but chart is not loading. Can we remove FusionCharts watermark at the bottom. We have licensed version of fusion charts V3.2. Clear your browser cache – very important step. Can somebody paste here the content of an example JSON file, which could be a replacement of the file from the following link: “http://otter.topsy.com/searchhistogram.json?q=html5&slice=86400&period=7”. The API id expired and the example app cannot display the chart (return a message like “no data to display”). For those who don’t want to play with API key, here is an example definition of JSON for this app. Just place it somewhere on the web (or local server like MAMP), and modify the self.twitterQuery assignment. Looks pretty cool. Fabulous work by fusioncharts team ! I’m trying to implement fusionchart to my iphone application. I have downloaded the sample code. When i run the application, it says ‘no data to display’ even though i changed the API key. When i executed the “http://otter.topsy.com/searchhistogram.json?q=html5&slice=86400&period=7&apikey=SDLXOEYG5E5NQP6HQYLQAAAAAB3K5VL55NIQAAAAAAAFQGYA” in address bar, it says error: invalid user. What could be the issue ? and also i would like to know how to pass locally stored data to the chart ? The API key for topsy.com been expired. Can you please regenerate once the API key and append the key to the below code? Instead of retrieving data from Twitter, you will need to generate the data in pre defined format and pass it to the above code. Thanks for your reply. Yes, i have already googled and got some key and it’s working fine. But still i couldn’t figure out how to pass plist data to the chart. I added one more chart to the above example but it shows “Loading Chart. Please wait”. Do I need additional js files in my project? If I use new FusionCharts(‘Pie3D’, ‘twitter_data_chart6′, ‘%f’, ‘%f’, ’0′, ’1′); in iPAD Webview I am not getting Pie chart in 3D format. Also enablemultislicing is not working in recent version..how to perform that function? I am getting “Chart type not supported.” error!! HELP!! Can you please drop a mail at support[at]fusioncharts.com with more details?